Hello happy readers! I hope you all had a great weekend. I did some baking for a birthday party and made some colorful and sweet treats that were completely devoured! I also did another escape room, one which I am sad to say broke my streak and we did not complete. Guess we were just not at our best that day but I plan to go back and try that one again because I NEED to finish! 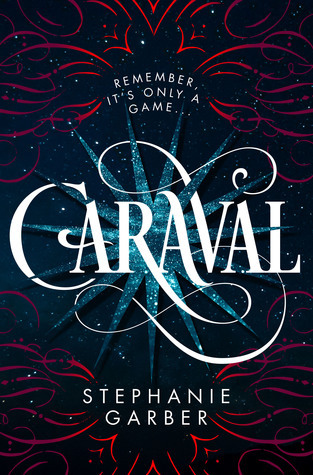 That said today I want to share my thoughts and feels about another mysterious game, Caraval (Caraval #1) by Stephanie Garber. This was a debut book that came out at the start of 2017 and had me interested well before that with all the buzz. Now having finished it I am excited to be able to discuss. Also don’t forget to check out my giveaway here open until the 7th. Caraval is a story of a game. That is what young Scarlett is told, tales of the magical performance hosted each year hosted by Legend, the master of Caraval. She has dreamed of leaving her tiny island with her sister Tella and their abusive and sick father in hopes of witnessing the magic herself. After years of writing hoping for an exclusive invite the waiting is over. With help from a mysterious sailor Tella and Scarlett are whisked away to the show but circumstances separate them and Tella is kidnapped by Legend himself. As it turns out she is to be the center of his game this year, whoever finds her the winner. Granted one wish. Told over and over again that everything is a performance for the games, still all the feelings for her are real in this game. There is always something around every corner and no way to know what is real or an act as the nights rage on and things turn dangerous. Scarlett must find her sister before the end of the game or risk the consequences. Welcome to Caraval…careful of getting swept too far away. I listened to this in audiobook format and it was amazing. I really enjoyed the different accents that helped separate the characters and fit with what their personalities were. As the story progressed and we got deeper and deeper inside Caraval I was totally immersed and I loved it. The story is of sisters and magic. You see from the start that they are very different but they still love one another and constantly want to protect the other. They have different ideas of what that will look like. Scarlett is set to marry a man she’s never met but has written and promises a safe life for her and her sister. She doesn’t need love and she’s given up on the hope of magic she only wants to escape and survive. Tella is more carefree and wants to escape into the wild unknown and figure it out along the way. I love the dynamic between them. As with most real relationships it seems one side might care/love/give more than the other. As they are separated through most of the book Scarlett is left to depend on her own wits. She does have Julian, the sailor who helped them arrive, though she isn’t sure if she should trust him. He seems to know more about Caraval than her, but is that an asset or not? With time working against her she only has a few short days to find her sister and win the game untangling the past and the mysteries. There are clues to follow if you wish to win the game and plenty of other distractions to make the most of. I really enjoyed the back and forth between Scarlett and Julian as things seemed genuine and legit how two people would act having only just met and put in this situation together. I loved how some moments I was rooting for him and others, okay lets be honest I was rooting for him almost all the time, but there were times where I doubted myself and if I should be. They are in Caraval after all and nothing is what it seems. Caraval, this whole world is beautiful and amazing. I loved how everything came to life with such vivid descriptions that jumped off the page. This world is really one of wonder. There is always something to see and do as the pace kept you moving. Always something to see or do, always a sense of urgency with Scarlett on her quest. She has so much happening seeing this world through her eyes as she grows and learns as a person was beautiful. I couldn’t stop listening! At the end I felt satisfied but I still wanted more, some questions had come to mind and I was thrilled to hear at the end there will be a second book! I was so happy for that. And even more that by the time I finished they have come out with the cover and date for it so score one for procrastination! I would highly recommend this book to anyone who enjoys a fun character driven story full of twists and turns! Great review :) I've had this book on my list forever! The premise sounds really interesting.